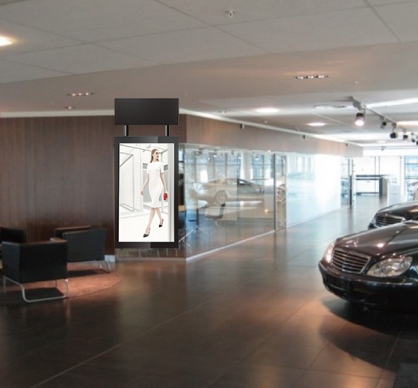 This stunning suspended digital display is quick to use and extremely user-friendly. The Full HD screen allows for high contrast viewing from any angle and is equipped with built-in speakers, network connector, WiFi and USB connection. This stunning suspended HD display is quick to use and extremely user-friendly with “Plug and Play” functionality. Simply load your content onto a USB memory stick and insert into the display. The content will be copied to the internal memory and will play on a continuous loop. Free scheduling software is supplied with each digital advertising plinth allowing you to schedule content and add or adjust transition effects. Take full control of your messaging. Schedule information to appear at specific times of day, for example you can set the breakfast menu to appear from 6am-10am, then lunch from 10am-1pm and so on. A superior finish is achieved on these suspended displays with a super slim profile and high quality materials throughout. Each multimedia display is fitted with commercial grade LCD panels providing a wide viewing angle, stunning colour, contrast and brightness.